Unless you read gossip blogs and have seen paparazzi photos from the set, you probably haven't heard of Law Abiding Citizen. 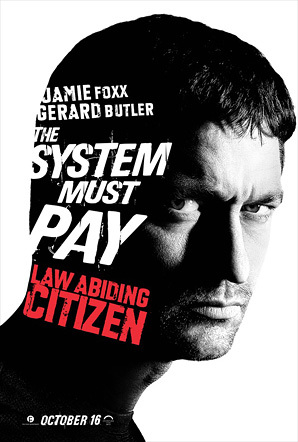 The film stars Gerard Butler as Clyde Shelton, an "everyday guy" who decides to take justice into his own hands after a plea bargain sets his family's killers free. His target: The district attorney who orchestrated the deal. It's directed by F. Gary Gray, who last brought us The Italian Job and A Man Apart before that. Don't get this confused with The Bounty though, the film that Butler is currently shooting, as this isn't a comedy, it's a thriller through-and-through. Anyway, check out the poster below. Update: Added the second poster of Jamie Foxx to the right courtesy of director F. Gary Gray on Twitter. This actually comes from Fandango (via Gerard-Butler.net), which is an odd place to debut a poster, but oh well. I'm featuring this because I think it's a pretty damn cool first teaser poster (I love the stark black and white design), even though Butler's eyes look like they're slightly deformed. I really hope we get to see a trailer for this sometime soon, as it actually sounds like it might be pretty awesome. In addition to Gerard Butler, this also stars Leslie Bibb, Jamie Foxx, and Viola Davis. 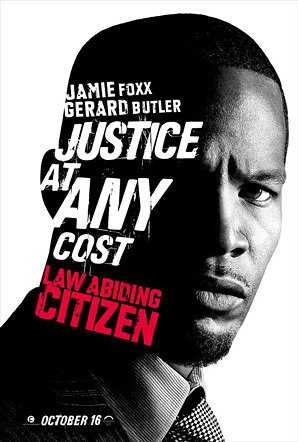 Overture Films is releasing Law Abiding Citizen on October 16th later this year. It shouldn't be too much longer till we see a trailer, so stay tuned! I really like the concept of the poster, but there is something meh about the execution. Seems like they could have done more with the idea. Haven't heard of this film before, but the premise sounds pretty cool. Nice concept but I agree. Really poor execution. It almost looks like something a fan would make. They really could do better. The two previous posters were far superior to this one. I don't know. The Brave One, Death Sentence, Death Wish (ALL OF THEM), Falling Down, and to an extent, Closure... they all follow that same basic plot (Death Sentence follows that EXACT plot). It seems played out. The poster is kind of cool, but it does nothing for a throwaway plot. This post is kinda misleading: these aren't the real posters and Gray said so on his twitter stream - that he was asking his fans/followers for their opinions on the posters. We don't know what the final products will look like yet, as far as I understand.